Mailchimp Pro's Comparative Reports compile data from your sent Regular and RSS campaigns into a comprehensive, shareable report. Choose any number of campaigns to compare to help you identify patterns in subscriber engagement, and improve and target your campaign content. This feature is included with Mailchimp Pro, which is available to add on to any pricing plan. In this article, you'll learn how Comparative Reports work and what information is included in finished reports. Comparative Reports only include data from sent Regular and RSS campaigns. When we talk about Comparative Reporting, we use some terminology that's a little different from how we talk about other tools and tasks in Mailchimp. A preview of the data we'll pull based on the campaigns and segments you choose. If you're satisfied with the preview, you can finalize the report and generate a Snapshot. A static report that's based on your report criteria. Any time you run a report, we'll present a static Snapshot of campaign performance data up to that point in time. Snapshots can be scheduled, shared, or exported. A representation of aggregated performance data across all the campaigns in your report. List segments you add to your report appear after the Baseline, so you can see how specific subscriber sets compare to overall audience engagement. Individual and combined conditions you use to filter subscribers into segments. You can use conditions and groups of conditions to create complex subscriber segments to compare against your Baseline. The first group of conditions in your segment. The Any and All logic assigned to the top-level group applies to all the subsequent groups in your segment. Comparative Reports let you compare as many Regular or RSS campaigns as you'd like from a single list. Choose a list and which of its campaigns to compare, and we'll show you aggregated and individual campaign statistics. Each Comparative Report saves the specific parameters you set, so you can generate the same report over time to track overall campaign activity in a series of Snapshots. If you send more campaigns to your list that fit the parameters you set for your report, your report will update to include data from those campaigns. You can generate campaign Snapshots manually as many times as you want, or schedule them to generate daily or weekly. You can also export or share your Snapshots. Using a method similar to regular list segmentation, you can track certain subscribers' engagement with your campaigns over time. Comparative Report segments allow you to combine any and all logic in a single segment. After you create a Comparative Report, you'll find it on the Comparative tab on the Reports page in your account. We'll display one of four different icons to let you know the status of a Comparative Report. Reports that have been created, but do not have a Report Preview or Snapshot yet display a draft icon. Reports that have been scheduled to generate a Snapshot display a scheduled icon. Reports that are still generating a Report Preview or Snapshot display a processing icon. Reports that have been finalized and have at least one Snapshot display a green checkmark. To view Snapshots for a completed report, click the drop-down menu for the report and choose View Report History. 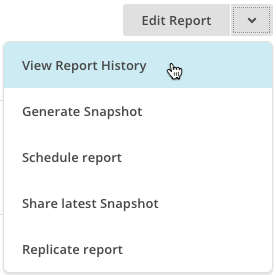 Each Snapshot includes report data on your campaigns from the time it was generated. Snapshots include three major sections: aggregated Results, Performance Over Time graphs, and comparative results. The Results section gives you an overview of your campaign statistics, including open and click rates for each segment in your report. All Snapshots include a Baseline segment, which displays your aggregated campaign data, so you can see how your added subscriber segments compare to overall audience engagement. The Performance Over Time section displays a graph of the data for each segment in your report, including the Baseline. Graphs default to display open rate. Use the Open Rate drop-down menu to view a different set of graphs, such as click rate or bounces. Each dot represents a campaign. Hover over a dot to view the send date and campaign-specific statistics. The date range is displayed on the X axis, and the percentage rate is displayed on the Y axis. The comparative results for your campaigns display at the bottom of your Snapshot and show a detailed breakdown of how each segment performed for each campaign in your report. Subscriber segments display after the Baseline for each campaign. Learn how to create, send, schedule, and share Comparative Reports with Mailchimp Pro. And use segments to see how campaigns performed with subscriber sets.